It’s quite obvious for businesses to keep exploring options and ways to drive sales and boost revenue growth to realize its objectives. After all, it’s the very purpose of their existence to maximize the investment and seek increased ROI. As a result, innovative ideas are sought, creative people are hired, more efforts are put and meticulous planning is done to seize that elusive edge. Impressive reports and cutting-edge analytical data do indeed help to a great extent but their utility is more in execution and implementation than mere perusing. With sales team already stretched to the brim, technology appears the last bet in the task of bringing marketing benefits in. As your business is already leveraging the CRM platform from Salesforce, your marketing initiatives have to be equally powerful and robust. Which is why, Salesforce apps help a lot, as they’re fitted with the kind of excellent features and functionalities often associated with Salesforce. Using these apps are sure to give a much-needed momentum to your business and bring a marked difference at various fronts. 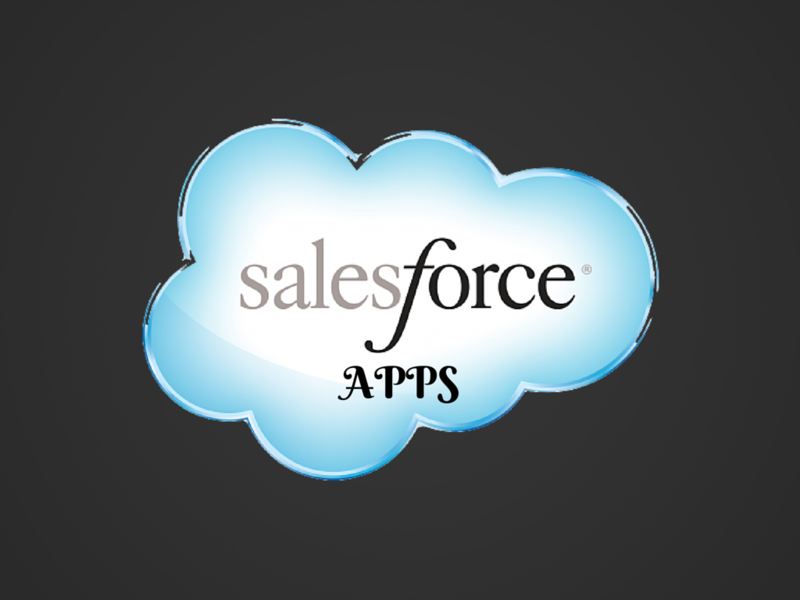 This article is focused on salesforce platform specific apps. You may also want to check out our business apps for entrepreneurs. The Bizible Marketing Analytics app is designed to help business take the best marketing decisions. It’s able to get integrated with all online marketing channels, including Adwords, in a simple and hassle-free way. And for off-line channels, it gets easily integrated with Salesforce campaigns to let business optimize revenue. It brings benefits of omnichannel marketing attribution and its impact is available for multiple channels. Additionally, it gives freedom of viewing and analysing online and offline touch points together. Once you set-up Salesforce app, it comes with built-in reports and dashboards to help with marketing activities. It’s compatible with marketing automation and e-mail marketing apps from different vendors to bring more value to your business. Coming with a 30-min installation, this app is sure to add value to your marketing vision. Every business wants to turn viewers into customers to grow and flourish beyond their potential. Vidyard is an excellent app that helps in that target by leveraging a video marketing platform. It emphasises upon turning videos into assets by aligning with CRM and automation tools. The app is about adding a video layer to further strengthen the Salesforce experience and bringing marketing benefits. It’s an app that gives businesses a simple interface to engage in uploading and sharing of videos. In doing so, the level of interaction goes up with contacts and leads and you get a detailed video data. It brings an opportunity to track viewers’ behaviour and analyse their preferences based on that. This app is extremely helpful for business already benefiting from Salesforce products. Its successful use is sure to get superior engagement with your target audience and make them become your customer. A successful business is one that has great insights into its marketing performance. Similarly, it’s very important for enterprises to have a quick visit into its overall marketing lead goals to devise action and plan based on that. Free Lead Generation Report is a helpful app for marketing that syncs with your Salesforce data to fetch a great peep into various performance indices of the team. The app enables you to access and view the lead trajectory and forecast lead generation performance of the team. Its integration into your business is sure to save hours that often go into building reports of various nature. It becomes easier to make a chart and track lead-gen performance against goals. Using this chart, a pattern to lead trajectory can be devised to suit business’ time schedules. This app ensures that your teams are in the know of performance together with knowing the targets to achieve. In that way, marketing gets a major boost. Fast Forms is a very helpful app for businesses to create web forms and surveys in fairly quick time. Using these powerful forms, your business becomes capable in capturing leads in few clicks. Without any complexity involved, the app helps you capture cases, contacts and custom objects with effortless ease. All you need now is to do simple copy and paste to make and publish a web form. The app brings flexibility of publishing these forms on any site, and it does not need any technical expertise to make a web form. Say goodbye to those complicated and cluttered integration techniques and just a simple drag-n-drop interface makes you create web forms. What’s more, the app offers variety of features to add value to forms. How about an app that enables integration of MailChimp subscribers and Salesforce leads? Sound fantastic! Yes, it’s, and that’s why an app like CloudChimp becomes important for marketing purposes. Packing some exclusive and unique functions, it brings the best of both worlds – Salesforce & MailChimp – to keep your business in good stead. Using this app, your business is equipped in creation and syncing campaigns from Salesforce to Mailchip. The app enables your CRM to fetch campaign reports and sync subscribers. Mails can be sent directly from your CRM together with using merger fields. In addition, a simple interface gets available for your business to manage various lists and templates. In essence, CloudChimp is a beneficial app that gives your business an array of features to help in marketing campaigns. Having a qualified team is surely not enough for a business to reach to its intended goals. There are a lot of factors to look into, variety of reports to gloss over and then, there are those usual human resource issues to handle with great care. Having already availed Salesforce consultancy was indeed an excellent move to give your business a superior platform to communicate with customers and engage with them in innovative way; but your business needs more, and there’s no way to miss out on infinite potential of technology. It’s time to fully leverage Salesforce products to give that distinct advantage to your business and keep it ahead in the market. Akshay Sharma is a digital marketing enthusiast and has written many topics on the related field. He works with CloudSocoius, which provide Salesforce Consulting Services.